Posted by Mrs Weird Scientist in Animals, Cats, Easy As Pie. If you’re like me, you are perhaps super fascinated by vicious beasts of the animal kingdom. At the same time, my vivid imagination means that I do cringe a bit (or a lot!) when I think about these beasts attacking their prey. But are these animals with long, sharp teeth really so ferocious? Nope – they’re not necessarily as ferocious as we think! The North American sabre-tooth tiger – now extinct – had some enormous teeth. In fact, if you picture two long, sharp kitchen knives, you’ll have a general idea of just how intimidating the tiger’s canine teeth were! It turns out, however, that the scary look of the teeth is somewhat deceptive. The tiger’s bite is actually a lot more gentle than scientists initially thought. It might even surprise you to know that the tiger’s bite is gentler than the bite of a lion. Why compare it to a lion? Well, it’s because the lion is one living animal that is very similar to the sabre-tooth tiger. By using computers to compare the intricacies of the tiger’s skull with that of a lion, it was found that the sabre-tooth tiger – formally known as Smilodon fatalis – has a rather light bite. 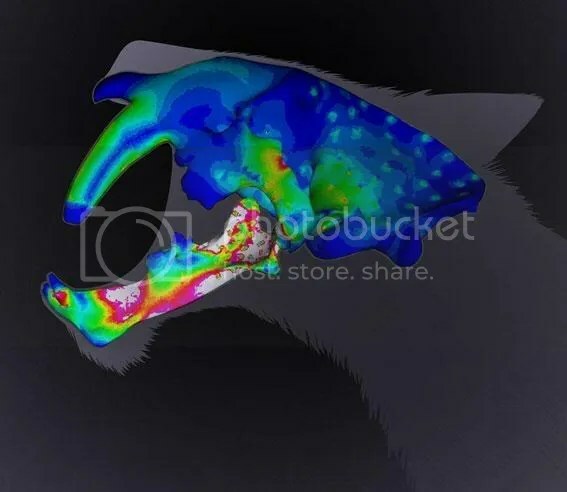 Colin McHenry of the University of Newcastle, Australia looked at the skulls of lions and fossilized sabre-tooth tigers using computed tomography (CT) scans. McHenry and his team created three-dimensional computer models for a lion and a sabre-tooth tiger, which were then used to determine the bite strength for each animal. The results can be seen in the Proceedings of the National Academy of Sciences. So, just how big of a difference was there? Well according to these models, a 250 kg lion can trigger a force of 3000 Newtons with its bite versus a 230 kg sabre-tooth tiger, which can produce a mere 1000 Newtons. A cool difference that researchers noted was that a lion can handle much more force generated by a struggling prey whereas a sabre-tooth tiger can’t withstand so much pressure and instead, would have been considerably injured. The ways that an animal kills its prey can lead to its extinction. How so? For the sabre-tooth tiger, it likely killed its prey by tackling it down to the ground, forcing its head down, immobilizing it and then snap – taking a quick bite to the prey’s neck. While a lion can capture smaller prey, the sabre-tooth tiger would not have been fast enough to conquer smaller, speedier animals. This means that when large prey were abundant, the tiger would be fairly well fed but when its preferred animals became scarce near the end of the ice age, the species soon became extinct. Still, I don’t doubt that the sabre-tooth tiger could do some serious damage to its prey. It may have a gentle bite in comparison with a modern lion but I think I’ll stick with a cute, household cat. That’s one bite I can definitely handle!